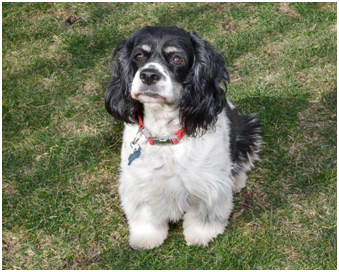 Lady [Adoption Pending] is a 5-6 year old, black and white female cocker who came into rescue as a stray. Lady loves to walk, which is good as she needs to lose a few pounds (she is very food driven!) She walks well on a leash.She comes when we call her - or any of our dogs.We aren’t sure she knows her name, but she does come when we call! 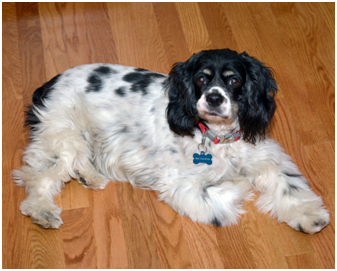 with us and cuddle, and seeks attention when she needs it.She is crate trained - she sleeps in a crate and is crated when we are not at home. Lady would make a wonderful companion in a home with or without other dogs.